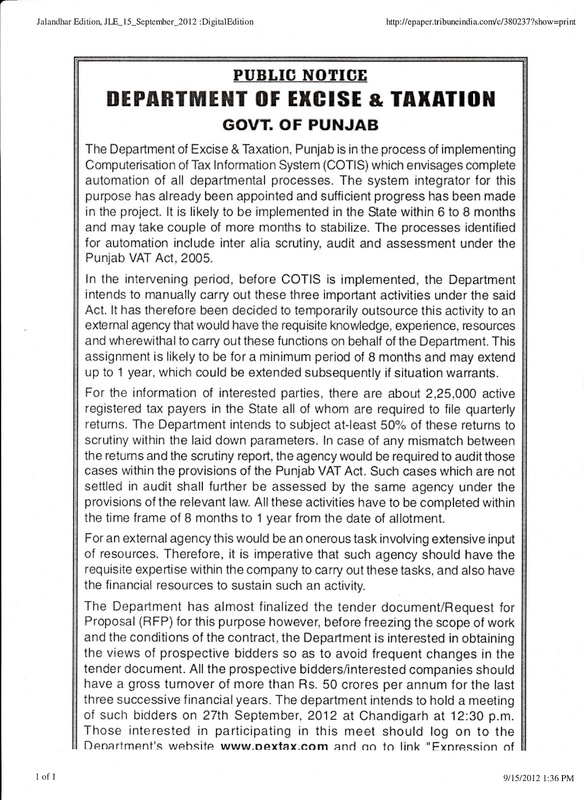 Excise & Taxation Department, Punjab is looking forward to handover the scrutiny, audit and assessment process in the hands of some external agency for a limited period of 8 months to 1 year till the time the new system i.e. Compuerisation of Tax Information System (COTIS) is fully implemented. A Public notice to this effect has been issued on 15-09-2012. 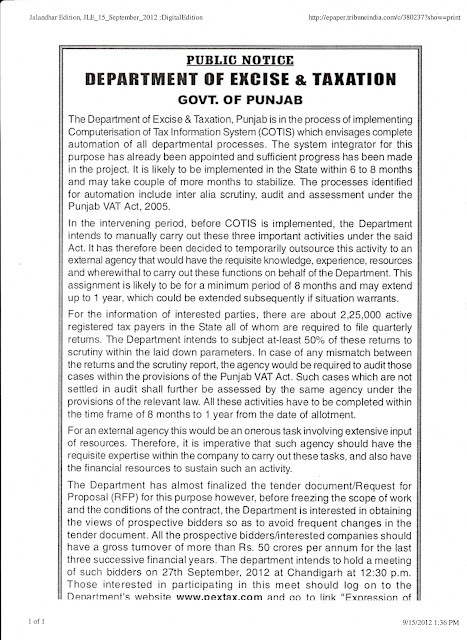 The Public notice states that the Department of Excise & Taxation is in the process of implementing its new system i.e Computerisation of Tax Information System(COTIS). This system will help in automation of processes including inter alia scrutiny, audit and assessment under Punjab VAT Act, 2005. Since the implementation of new system will take time of 6 to 8 months and also further a couple of months to stablize, therefore till the time system gets implemented the Department has decided to temporarily outsource the activity to some external agency. As per the public notice the Department intends to scrutinize 50% of the returns within the parameters laid down.In case of any mismatch between scrutiny report and the returns, the agency would be required to audit those cases within the provisions of Punjab VAT Act, 2005. Such cases if not settled in audit, will be assessed by the same agency with a period of 8 months or 1 year from the date of allotment. Thus the Excise & Taxation Department intends to get the process of scrutiny, assessment and audit from an extenal agency till the time new system COTIS is implemented. The question is why the external agency is needed? is it because of shortage of manpower with the Department or due to the fact that the Department's officials and staff lack such special expertise to conduct scrutiny, audit and assessement, which the external agency may provide?